For many it is a disease that still carries a stigma. We can all remember television adverts from the 1980s reminding us about the dangers of HGV, to keep safe while trucking, and to always use a convoy. Geoff Stop, 37, is a trucker who now suffers from HGV. He describes how it happened. "I was at the truck stop to have a short break, I was bursting to go. It was a moment of madness, I didn't think I would catch anything." He begins sobbing as he talks about the depraved act he committed, which is too disgusting to repeat here. It is partly due to censorship that people continue to catch HGV. Because nobody is ever able to learn how the disease is transmitted, they cannot do much to avoid it. Truckers are particularly vulnerable. 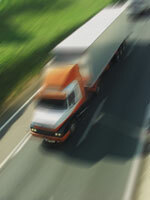 HGV sufferers can live normal lives but suffer from a deficiency in their motor skills. Many of them have trouble reversing, or dumping their loads. It can also lead to the more serious condition known as Trucker's Elbow, which can lead to death - not for the trucker himself but for any hitchhikers or prostitutes they have picked up. For many years, Trucker's Elbow was thought to be a myth invented by murderous drivers to excuse their killings. However, doctors have since isolated the HGV virus that leads to it. Mr Stop has not yet developed Trucker's Elbow and is hoping to live with HGV for many years yet. "I sometimes feel a bit stabby," he admits. "Hopefully I'll get out of the trucking business before it becomes too serious."